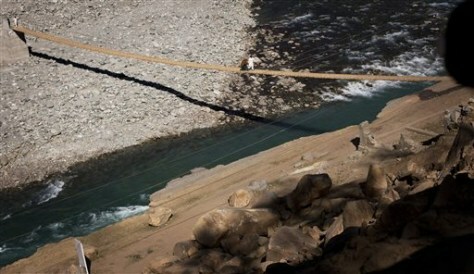 Villagers cross the Swat River on a makeshift bridge in Kalam in Pakistan's Swat Valley on Nov. 1. The floods that swept through the country began in the northwestern Swat Valley and were at their most ferocious. Only one of 51 bridges survived. Hundreds of homes and businesses were swept away in hours. The floods that hit Pakistan in the summer of 2010 took 2,000 lives and affected 20 million people, of whom 7 million remain homeless.